Emphasis here was an autoregulated 5 x 5 on the dips, with two lead-in rounds to kick things off. Quite a bit of upper body volume with this workout. But, in maintaining proper rowing form, the glutes and hams get a little bonus iso work as well. Not as easy as it sounds after a heavy sprint workout the day before. 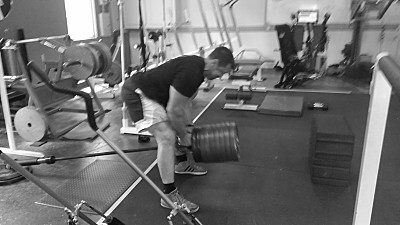 The original plan was to hang at 175 with the landmine rows, matching the 5 x 5 with the weighted dips. But hell, I felt strong at 175, and decided just to go ahead and autoregulate my way on up. The big key to landmine rows is to minimize hoisting, flinging, or “leveraging” the weight to the chest. Load it up, you bet — but keep form in check. Really squeeze the shoulder blades at the top of the movement, pin the weight to your chest, and control the eccentric. Keep your back flat, and your chest up. Work the movement; don’t let the movement work you. Principles trump programs, always. Learn the principles (autoregulation is a great place to start), and you’ll never be hemmed-in by mere programs. Because the fact of the matter is, no matter how good the program — and there are some awesome ones out there (5 x 5, for example) — you’ll eventually outgrow it. This is the basis of the Five T’s.